I wanted to make a dessert last weekend for the blog (and for our enjoyment on Friday night!). I needed to narrow down my options – it’s a little tough just to say “I want to make a dessert” – so I decided to focus on tarts. I bought a tart pan at Williams-Sonoma a few moths ago and hadn’t used it. 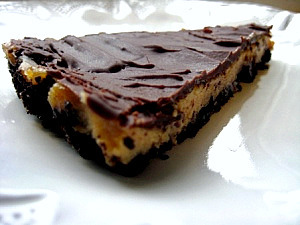 I sent Brandon and a few friends an email with tart options and the overwhelming response was that I should either make a peanut butter tart or a chocolate tart. Brandon had the genius suggestion to combine the two. So off I went in search of a chocolate peanut butter tart. I found this recipe online on the cooking blog Alpineberry. It’s originally from Fine Cooking magazine. 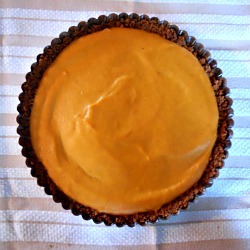 This tart did not disappoint for my first foray into tart making. The chocolate and peanut butter flavors went together so well. If you love chocolate and peanut butter as much as I do, I highly suggest you give this one a try! Preheat oven to 350 degrees. Have an ungreased 9 1/2 inch fluted tart pan with removable bottom ready. Place cookies in a food processor and process until finely ground. If you don’t have a food processor, you can place the cookies in a gallon bag and use a rolling pin to crush. In a medium bowl, mix the cookie crumbs and sugar until well blended. Drizzle the melted butter over the crumbs and mix until the crumbs are evenly moistened. 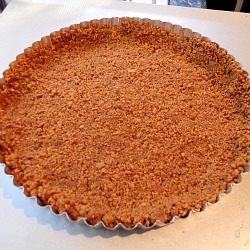 Put the crumbs in the tart pan and use your hands to spread the crumbs so that they coat the bottom of the pan and start to climb the sides. Use your fingers to pinch and press some of the crumbs around the inside edge of the pan to cover the sides evenly and create a wall a scant 1/4 inch thick. Redistribute the remaining crumbs evenly over the bottom of the pan and press firmly to make a compact layer. 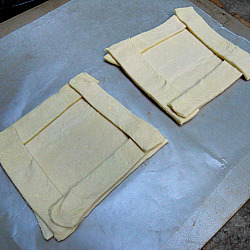 Bake the crust in preheated oven for 10 minutes. Cool to room temperature on a wire rack. In a medium saucepan, bring the milk and salt to a simmer over medium heat, stirring occasionally. Meanwhile, in a small bowl, whisk the egg yolks, brown sugar, and flour until well blended. Slowly add the hot milk to the egg mixture, whisking constantly. Pour the mixture back into the saucepan and cook over medium heat, whisking constantly, until it thickens and comes to a full boil, about 3 min. Continue to cook, whisking constantly, for 1 min. Remove the pan from the heat and add the peanut butter and vanilla; whisk until well blended. 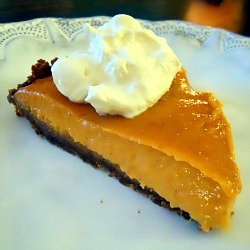 Pour the hot peanut butter mixture into the crust and spread evenly. Gently press a piece of plastic wrap directly on the filling’s surface to prevent a skin from forming. Refrigerate the tart until cold, about 2 hours, before adding the chocolate glaze. Melt the chocolate in a small bowl in a microwave or in a double boiler over medium heat. (If you don’t have a double broiler, place a small metal bowl over a saucepan of simmering water.) Add the butter and corn syrup and whisk until the butter is melted and the mixture is smooth, about 1 minute. Carefully remove the plastic wrap from the top of the chilled filling. 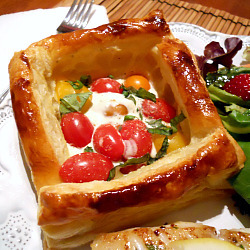 Drizzle the glaze over the filling and spread it evenly to cover the tart completely. Refrigerate the tart in the pan until the glaze sets, about 30 minutes or up to 12 hours.